Many people who hit the gym tend to concentrate more on the lower body exercises and the body parts with muscles that tend to bulge easily, and they can end up forgetting about the back and shoulder exercises. You should know that working out your upper body is very important if you want to maintain an all-round fit body. Being well rounded and robust from your back, shoulders and the rest of your body gives you a good posture and an excellent body shape. For around 1.5 decades, John Cena was the face of the WWE. Although he is now slowly stepping back and taking on more of a part-time role for the company, he is still a very prominent figure in the squared circle. If rumours are true, at this upcoming Wrestlemania event, he will be taking on The Undertaker, in one of the biggest matches of his career. One thing that is instantly recognizable about John, is his amazing physique. At 6ft 2 and over 240 pounds of solid muscle, he is a physical specimen. That’s why we’ll be taking a quick look at the John Cena workout routine, to help you train like a multiple-time WWE champ with one of the best physiques in the business. Why Study the John Cena Workout Routine? Those that have seen John Cena, will know how big and jacked he is. Cena is vascular, he is ripped, he is always in shape, and he’s a very, very big dude. It takes a lot of commitment to strength training to see consistent muscle growth. To be able to fit training into their schedule, people often cut corners. While some neglect to properly warm up before slamming the weight plates on a barbell, most decide to skip their post-workout mobility session when pressed for time. While mobility training can be time-consuming, tedious, and uncomfortable, it is also extremely important to incorporate into your strength training routine. When it comes to hitting the weights, here are a few reasons why mobility matters. This article is exclusively on the right exercises to improve the strength of motorcyclists and make them better riders. For the record, the exercises will yield other desirable results such as improved metabolic activities, improved body detoxing, reduced unwanted fat, improved sleeping orders, improved looks etc., but these are only peripheral perks. The sole essence is to improve the riding performance of the motorcyclists. These exercises are great for beginner riders and veteran riders alike. If you think you are not fit enough to ride your bike and you are not motivated enough to try to get into riding shape, you can always visit sellbike.com for quick valuation of your motorbike and then unsubscribe to Project Swole, because those without ambition might not bother wasting their time reading these posts. Your lower body and ‘core’ plays the most crucial role in establishing contact with your motorcycle and balancing you on it, as a rider. Therefore, these exercises will be focused on those parts of your body. Exercising to improve those parts of your body is essential because, while riding, there’s a need to do a number of things, some of which are the need to shift the weight of your body between opposite pegs as your motorbike tilts from side to side when negotiating bends. There’s also a need to engage your legs as props and shock absorbers while doing an off road, and so on. Creatine is a substance that is naturally manufactured by the body. It is a nitrogenous organic acid that is considered to be the energy source for muscles. Identified in 1832, creatine is now one of the most commonly used supplements by those who practice sports, especially bodybuilding. Creatine supplements are especially appreciated for their positive effects in increasing performance for intensive training sports, maximizing workouts in general and offering an advantage in anaerobic athletic contests. At Project Swole our personal experience using creatine is increased strength for max effort training and increased stamina for short duration anaerobic activity (sprinting, higher rep training, Olympic lifting). If you have been reading weightlifting materials for any length of time, you have probably heard of 5×5 training. It has definitely worked for many trainees. I even made excellent progress on a 5×5 program. But with all this 5×5 hype, has anyone stopped to think that there might be an even more efficient way to train? In my experience, at least for experienced athletes, there is. This can be a powerlifting routine, a bodybuilding routine, or a conditioning routine. Sports athletes can use it, aspiring weight lifters can do it, beginners, novice, and advanced trainers can use it. Swole 3×5 approach to strength training is a free weight routine designed to get you back into shape, to give you a break from a more mundane routine, or to blast you through a plateau. Learn how to put together an exercise program the right way. Learn all the basic compound exercises, as well as some variations there of. Start to build a foundation for future sports or weightlifting success. Whether you are a body builder, powerlifter, Olympic lifter, or recreational athlete, you’ll probably get a kick out of seeing just how much you can lift (or in some cases, it’s your job). While some weight lifters try to hit a new 1 repetition maximum (1RM) on the main lift every single workout, this is usually not a good idea. The potential for injury and over training increases with every max effort lift you attempt. Instead, a better philosophy is to ramp up to testing your 1RM using several 3-4 week micro-cycles. However, that is a discussion for another day. Today I want to address the 1RM test itself, or more accurately the max effort test. 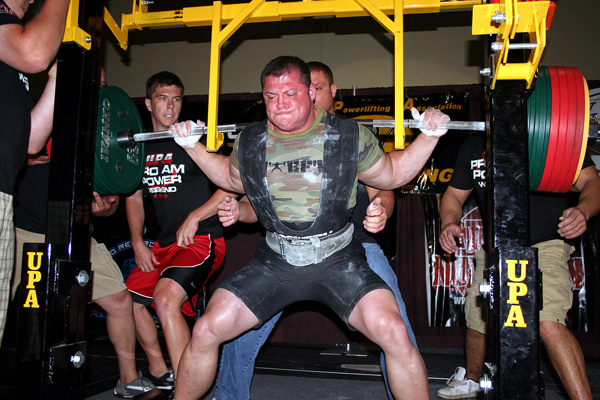 If you are not in a competition at that exact moment, there is really no need to attempt a true 1RM. As long as you have a stable frame of reference for your max effort attempt, you will be able to quantify your progress. I would like to suggest using 2RM for your max effort attempt. The reasons for this are several – safety, psychological, CNS activation, and time under tension. REASON 4: MUCH less negative impact on CNS (measured by HVT monitor) with a 2RM vs. a 1RM. Josh Hanagarne recently sent me a great piece of work. Enjoy. BTW, the quote in title is from Abraham Lincoln. Number one, it looked fun and people I liked were doing it. Monkey see monkey do. Second, I was getting strong enough that my hands were starting to become my limiting factor. This was a sobering realization which took place at the intersection of Lame and Weak. Like most things I like right off, once I jumped in, I jumped in all the way. Grip training was addictive for me. Better yet, it gave me one more way to make progress, which is usually the major ingredient in how happy I am. I could either set aside dedicated days for grip work, or, the more I learned, I could squeeze it in to my normal workouts without much of a headache. Before I tell you how I work grip training in, I just want to give you a quick look at four different types of hand strength so that you don’t overemphasize anything or neglect anything that could be useful to you.